When spraying others with good advice, we complacently preach that – on the whole, all things considered, taken in the round etc, etc – you get what you pay for. Yet in our own lives, we strive to get more than we pay for and are made wretched to think we might have got less. I was musing thus, cruising along the seafront last week in Bentley’s Bentayga, its big, much-praised and sought-after SUV. Prices for this two-and-a-half tonnes of luxury start at £138,000 but most cost a good deal more when extras are specified. Compare this with a range-topping Range Rover starting at £80,035, an Audi Q7 at £51,425 or a Porsche Cayenne at £55,965 and you soon find yourself wandering into value-for-money territory. Can it be worth the extra? The short answer is no. All those cheapies – not to mention other big SUVs such as Volvo’s XC90 (in which it claims no one has ever been killed), VW’s Touareg, Jaguar’s F-Pace, BMW’s X5 and the Mercedes GLS – will do all that the Bentayga does in great comfort and probably as reliably. They’ll also be cheaper to own and run. Admittedly, the Bentayga is said to have outperformed the Range Rover and the Q7 in an off-road test, but few owners are going to chuck their new babies around in quarries. Nice to know you could, though. So much for the short answer. The longer answer is: you’re asking the wrong question. 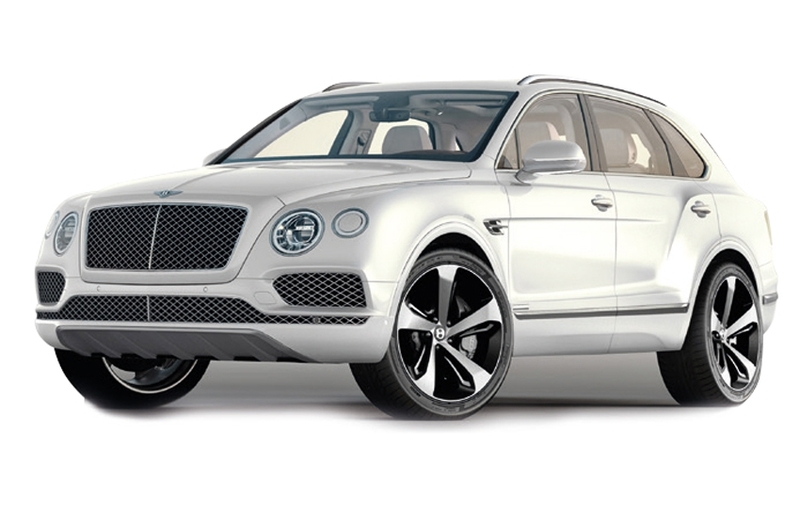 Years ago, Bentley’s market research told it that the average Bentley buyer owned seven cars. He – they were usually he – already had the competition. He might have to choose between a Bentley and another yacht but mostly it wasn’t an either/or decision; it was simply a question as to whether the Bentley appealed. Viewed from that perspective, it’s easy to see why the Bentayga is such a success story for the company and why it sold the first two years of production from the drawing board. It is so superbly and discreetly comfortable that it’s easy to forget you’re driving. Engine choice is between the 6.0 litre W12 petrol and a 4.0 litre diesel V8. I had the latter, which is almost soundless and configured to produce the traditional Bentley tidal wave of torque up to 168mph. It can also return about 37mpg. The A, B and C pillars are all fairly wide and the rear view isn’t the best for reversing, though the camera helps. Loading the boot is made easy by the lack of boot lip and, unlike with many modern cars, you do get a spare. Tyres cost upwards of £500 a corner. Having thought I wouldn’t, I particularly liked the head-up display; not just because I could pretend I was a fighter pilot. Doubtless all manner of data can be reflected in front of you but I chose only speed of travel and the speed limit for the section of road I was on. It was unintrusive, undistracting and helpful, the figures appearing as if slightly outside the lower right-hand corner of the windscreen. Uncanny but effective, it made for a relaxing drive in a car in which it is easy to double the speed limit without noticing. Brakes, gearbox, air conditioning, sound system, dial-up suspension, four-wheel drive and terrain response all functioned seamlessly. Would I buy one if cost and value- for-money were irrelevant? Of course – why not? Not because it’s a Bentley and because it will go off-road – I have a Defender and a tractor for that – but for the sheer pleasure of driving it. Before amassing the cash, though, it’s necessary to acquire at least six other cars to go with it.